Usually, the adrenalin pumps quickly when you enter the block. The way I do it, I unfurl my Obnoxiously Large Puerto Rican Flag ™ as soon as I leave the checkpoint, and let the flag rock overhead as I walk to the Capicu float. I’m a big guy, so I’ll get the thumbs up from any number of people, for being big and Boricua simultaneously. It’s the noise that does it for me, though. There are iconic, anthemic songs that hit your ears. Que bonita bandera/ la bandera puertorriqueña, over a big, bass-laden club beat. Or the iconic salsa of the summertime: Si te quieres divertir/ con encanto y con primor/ solo tienes que vivir/ un verano en Nueva York. And then, for the emotional and the patriotic among us: ¡Preciosa, preciosa, se llaman los hijos de la libertad! It’s always that last song that gets me. Preciosa te llaman los bardos que cantan tu historia. I honestly couldn’t tell you if Rafael Hernandez was an independentista—I’ll defer to the music biographers in our record stores for that. What I can say is that when he wrote Preciosa, it was 1937, the same year he wrote Lamento Boricano. He was in Mexico, and he was yearning for a homeland he hadn’t seen in a long time, having lived in New York City previously, and having fought for the United States in World War I. The bardo, the poet inside him, was moved that year to pen the two songs most revered by Boricuas outside its national anthem, and both of them refer to Puerto Rico as Eden. As in, the garden of Eden. The homeland. One depicts the jibarito walking in a town heavy with necesidad, with need. The other says we are triumphant despite the tirano, the tyrant, and is followed by a call for liberty. 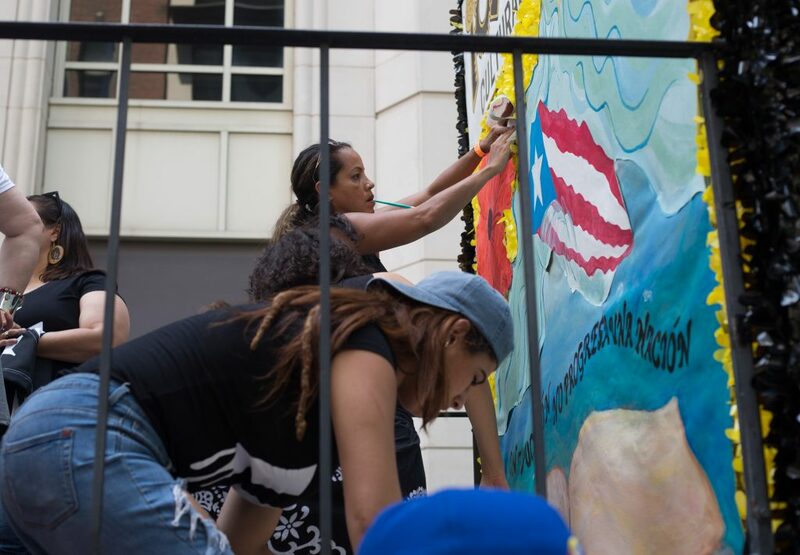 It’s an interesting time, to say the least, to be marching in the Puerto Rican Day Parade: one in which Puerto Rico is holding its latest statehood plebiscite, and in the midst of a controversy surrounding Oscar López Rivera marching in the parade. 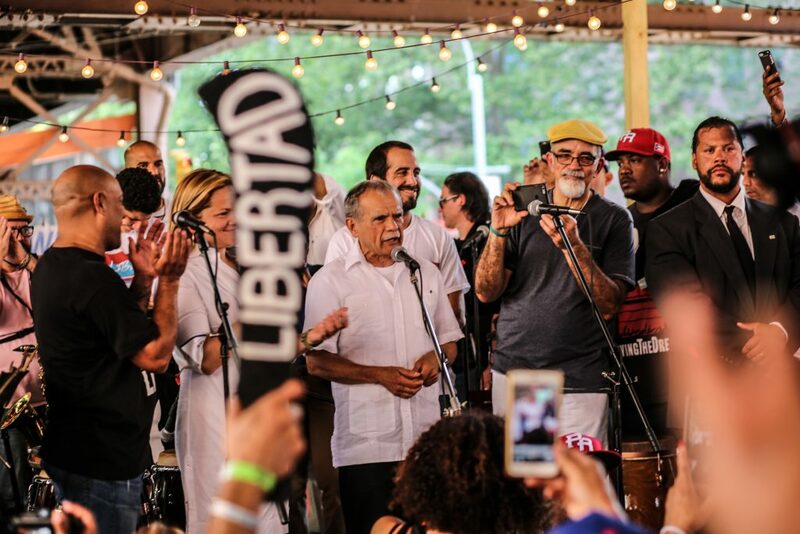 López Rivera is free after a 35-year sentence for seditious conspiracy against the United States—a charge almost exclusively used in the last century against independentista Puerto Ricans. When López Rivera spoke around the city, and in the media, in the days leading up to the parade, he spoke of a homeland for the children and young people to defend, and he spoke of peace with the United States. And of course, he called out some statehood políticos for putting themselves before the nation of Puerto Rico.Usually, the adrenalin pumps and the music is loud and the energy to march down the avenue is high. But this year was different. Gone were the corporate sponsors and their high-dollar sound systems. Goya was not around to distribute coconut water or peach nectar. 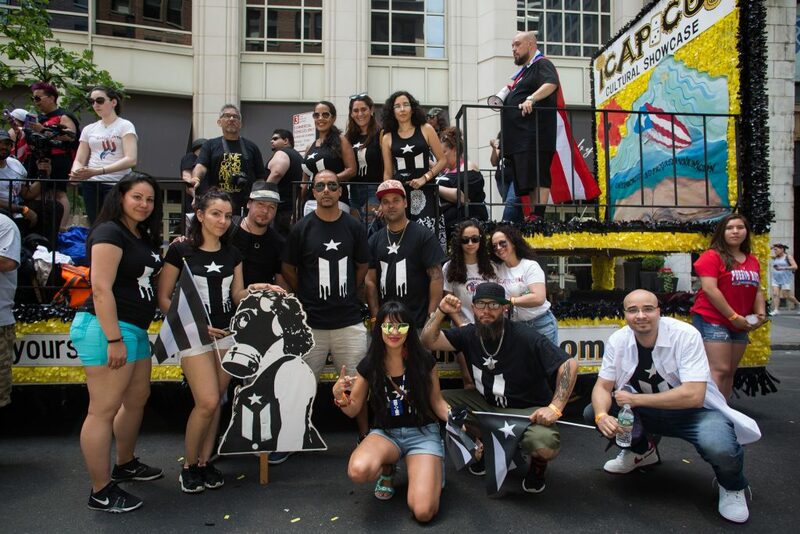 There was us: los bardos de Capicu, many of us wearing black shirts and carrying blacked out Puerto Rican flags, looking up and down the street for people like us. And we found them, in similar gear: Defend Puerto Rico, Vive Boriken, Uprose, Arte o Muerte, the Camaradas crew. The activists were out in force this year, and at least one guy on the street got it right: a white dude, standing on 6th Avenue, right before my lady and I entered the staging area. He saw the people wearing black, too, and immediately recognized the all-black attire of the Irish revolutionaries of the early 20th century. “Those are the real Irishmen,” he said. I think Pedro Albizu Campos—who helped draft the constitution of the Irish Free State—would be pleased. We started marching in this parade, in part because it had been illegal to display a Puerto Rican flag at all—in Puerto Rico, no less—right up until 1957. The parade became the ultimate slap in the face to anyone who hated the sight of the Puerto Rican flag, because if there’s one thing there’s no shortage of on parade day, it’s the bandera. Every flag tattoo is visible. Every size of flag is on display. Babies are dressed in it. Men and boys wear it like capes and carve it into their heads. Women and girls wear it on tank tops—and carve it into their heads. This year, the blacked-out Puerto Rican flag became a symbol of resistance against the Fiscal Control Board, the $72 billion debt, and the austerity measures brought against Puerto Rico; namely, the closing of schools and hospitals, and the defunding of the national university. Wherever you saw a blacked-out flag, you knew someone was protesting right along with you. And this year, the politics were out in full force. As well it should be. This is a critical time in the history of the island, and these are the kinds of conversations that are necessary, even if those conversations turn ugly. Pero fíjate: despite the presence of a knucklehead or two on the route, for all the hype about how divided the community is, out on the avenue we saw what we always saw: gente, gente, y más gente. Gente on the sidewalks, gente gathered on the side streets ready to march, gente decked out with the Puerto Rican triangle in various shades of blue (deep blue for statehood, royal for the commonwealth, light blue for independence), gente de Ponce y Lares, de Mayagüez y Fajardo, de San Juan y Carolina y todas partes. When we said wepa, the crowd said wepa. When we said Yo soy boricua, the crowd said ¡pa’ que tu lo sepas! And there was music, y’all. Our float, the Capicu float, sat right behind our boy Flaco Navaja with his band The Razor Blades. He covers all the salsa classics from Fania and beyond, and he sings his originals: ¡Puerto Rico yo te adoro y no te cambio por na’! 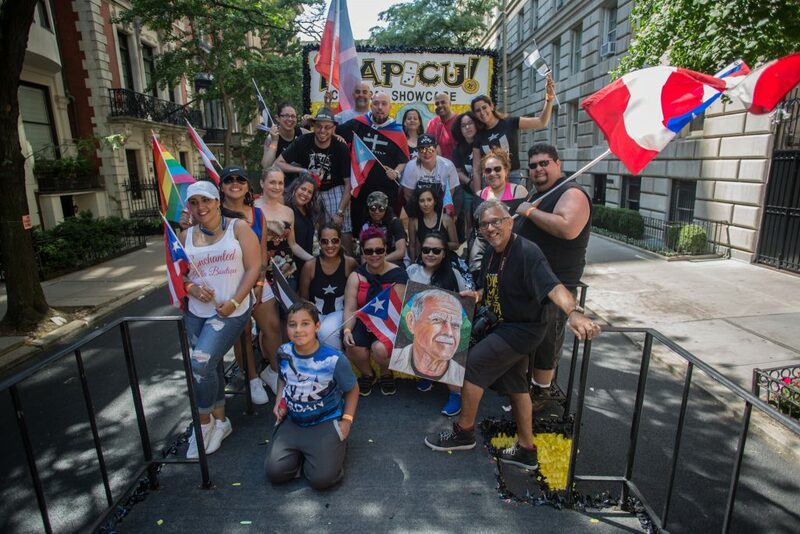 There was pride, there were some quizzical looks, but in the end, the conversation we needed to have was between the floats and the paradegoers—some in black, some not—screaming in unison for Puerto Rico and showing orgullo in the nation we come from. No, it wasn’t as loud. Yes, there were fewer tchochkes to hand out. 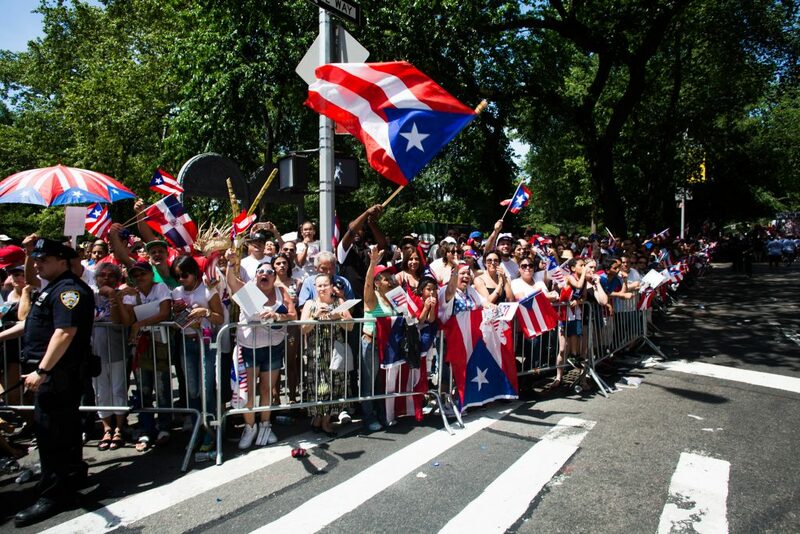 But in the end, all we really did was go back to our roots: a parade of proud people marching down the avenue to our music and 3 million Boricua flags. Despite the attempts to shatter us, we were united and on camera and very much presente. For his part, Oscar López ended up at the front of the parade, taking his boos and cheers for sure, but mostly out on camera saying thank you to his nation, putting a fist to his heart—a gesture I tried to imitate on the route myself. At the end of the route, in a sea of Puerto Rican flags, among signs that said “Statehood for Puerto Rico,” and “Abajo con Colonialismo,” we had found our rallying cry: The people united can never be conquered. 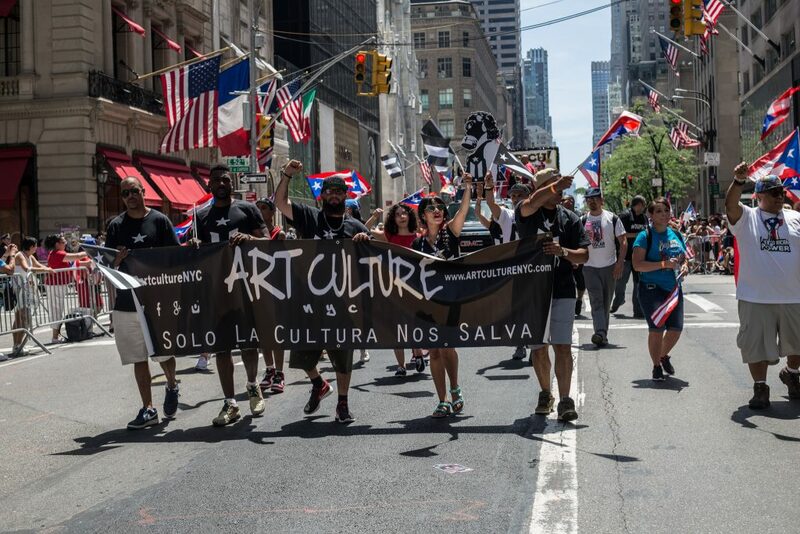 The chant went on for a good 30 seconds, and the float continued another ten blocks up, past the Metropolitan Museum, past the multi-million-dollar condos on the Upper East Side, and into the hopes that the future of the Puerto Rico will be decided by the ones who show up.